Melody Herzfeld is the drama teacher at Marjory Stoneman Douglas High School in Parkland, Florida, where 17 students and faculty members were tragically killed in February 2018. In the months since the shooting, she's helped students process their grief through the arts, some quietly, others on a quest to be heard—including in their performance of "Seasons of Love" at the Tony Awards (where Herzfeld was honored), their rendition of "Shine" at a CNN Town Hall, and their appearances in the media and in marches and walkouts. In the aftermath of the school shooting, your students advocated on a national stage for stricter gun laws. How did participating in drama give them confidence to speak out? Theater students are always encouraged to sing out, speak out, be heard, and tell the truth from the time they are first introduced to the stage. Many, if not most of our theater students, have been involved in theater since they were little children. They have always been drawn to the power of an audience. It was natural for them to immediately take action when it involved something they believed in. This tragedy put into use the skills they had prepared for in their short years. It was truly astounding. What role has theater played in helping your students heal? Theater not only allowed them to speak out and be heard at a national level and really a worldwide level, but it also allowed for a great deal of healing. Those in our theater program who have not been publicly "vocal" have used their voices to create songs, dance, speech, art, music, and writing. They used artistic expression to help cope with this nightmare. To be able to funnel this immense, overwhelming pain into something good, fruitful, beautiful, or even very dark shows us all how the power of the arts helps us to evolve. Students who do not naturally gravitate to the arts have also found great solace in this exploration. To not have to "achieve" something in its perfect form—a finished painting, a finished song, a finished product of art in any form—but to just give in to honest expression, can be enough. It can alleviate an enormous amount of stress and allow for failure without judgement. We all need this in our lives. As you watched your students perform their original song "Shine" at the CNN debate on gun control, what were you proudest of? It was only two short weeks after a life-changing event. The entire stadium went silent—in unison. You could feel the soothing energy in the air. After a very contentious night that was full of high emotion, it gave a great release to everyone. I was most proud of their courage to expose themselves fully. They suffered a lot of criticism, even after performing a beautiful song. 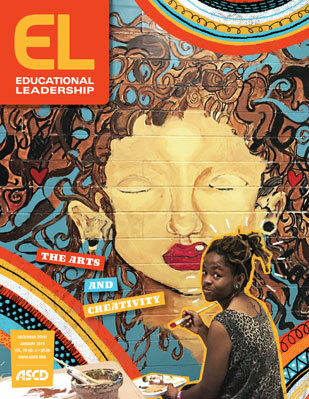 What would schools look like if the arts were part of the core curriculum? There would be collective collaboration. It would bring all types of people with different beliefs to share and join together. It would energize creativity in the world, bringing it into even our most mundane objectives. We would have color and beauty surrounding us at every turn. It would soothe anger toward those who are different than us. You've said in media interviews that the arts offer us hope. How are the arts keeping you hopeful as an educator? As creative individuals, we usually pour ourselves into a current project or show and sometimes get blinded by what we are working on. For us at Stoneman Douglas, the arts will give time to mourn our dear coworkers and students, take care of those who have returned from injury, and help our fellow teachers and students cope. We are not moving on right now—at least I can speak for myself. I am just in this moment. The right now in my life is coming to school every day and facing the exact location where everything happened and trying to grasp it. As a human, I have to believe I will understand this all at some point, but right now, I'm just here. Sometimes minute to minute throughout the day your mind takes you back and you can't quite recognize what actually happened. The arts provide beauty, goodness, and the belief that eventually life can be good.